This view clearly shows the Milwaukee Road track crossing the arm of the lake along the right center of the photo. 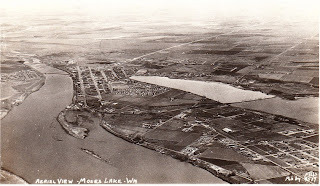 Implied is the wye not far from the crossing, with one leg following the arm of the lake on the left and to the depot, and the other leg headed in a southerly direction ending near the large building with the white roof. Most of this track is still extant, except for the wye and southern leg, though you can still find a few buried rails if you know where to look.